But let’s take one step back and look at the site designs themselves. Like I said earlier, some time ago Microsoft rolled out the site design and site scripts options. 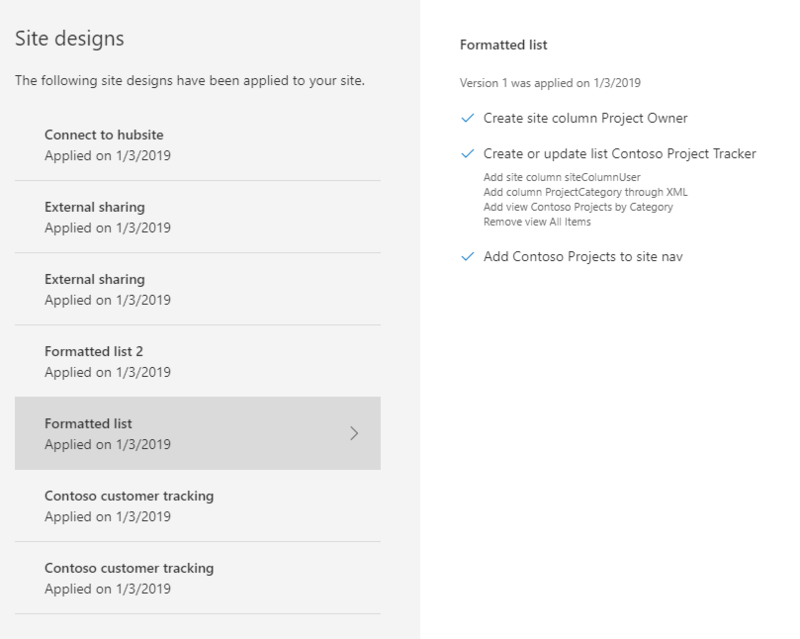 These options (only available for modern teamsites and communication sites) allow administrators to create custom site templates or part of sites. For example: a specific setting (see below), custom columns or entire parts of a site. There are two parts for this solution. One is the site design. The site design is the template your site-owners can select and use. It has a title, description and also one or more site scripts to be applied. It also contains a reference to the out of the box templates this site design can be applied to. This last option is called “Webtemplate” – 64 is the modern teamsite and 68 is the communication site. Part of the site design is the site script. This site script is in effect JSON code, which contain the parts of the template. This example script will add the site to a designated hubsite. Although the new site designs and site scripts are very powerful, you might need to go beyond the possibilities of these functions. And you can do just that using Microsoft Flow. Within the site script you can trigger a Flow to complete any additional actions. For more information on this, please read this article. Another thing that will come in handy is the ability to scope the site designs. A scope defines who can use the site design. This scope is based on the identity of the site design (see below) and is provided to specific users or security groups. For more information on this, please read this article. Site designs and site scripts are created on tenant level and by using PowerShell. You will need the latest SharePoint Online module for this. The site script itself can be part of the PowerShell cmdlets or you can use a JSON file for this. Let’s take a look at creating the script. In my example I’ve used an example script from Github. It’s the script I showed you before. When used, it will add the site to a hubsite call Intranet Home. The hubsite ID can be easly found when using the get-SPOHubsite cmdlet. Now that I’ve got the contents of the script, I need to add this to my tenant. And for this I use the Add-SPOSiteScript cmdlet. This cmdlet needs a title, description and the content for the script. When finished, it will provide me with a script-id. The script has now been added to my tenant. By the way, if you want to know which scripts have been added, just use the Get-SPOSiteScript cmdlet. The script now needs to be added to a site design. For this I use the Add-SPOSiteDesign cmdlet. This cmdlet will need to script-id and the webtemplate number (64: modern teamsite, 68: communication site). The site design has now been added to my tenant. By the way, if you want to know which designs have been added, just use the Get-SPOSiteDesign cmdlet. Now it’s time to see this in action. 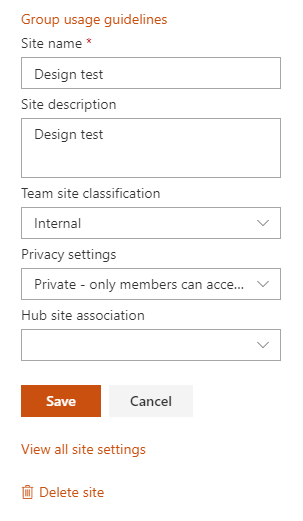 For this I’ve created an out-of-the-box SharePoint modern teamsite. This site has not been connected to a hubsite. From the settings-menu I can now select the Site designs option. This shows me the current site designs. As you might notice, I’ve tested several already. 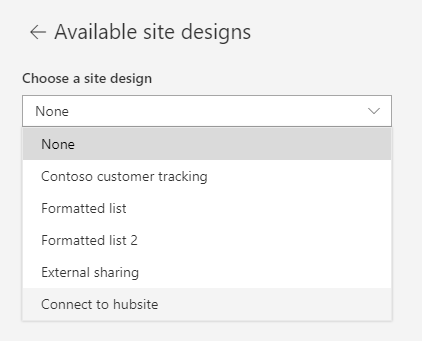 I select the Connect to hubsite option. I get an overview of the actions to be taken. In this case it’s not a very long list. It will just connect the site to my Intranet Home hubsite. When finished I see the relevant notification. But let’s check to see if this really worked. 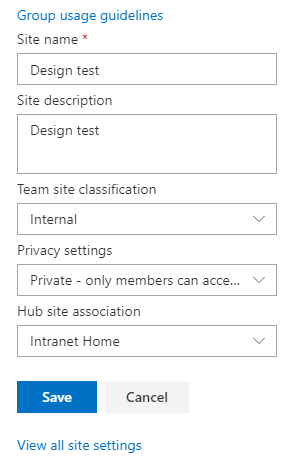 And presto: my teamsite is now connected to my hubsite. This example is very easy and shows the ease of this option. The power of this function will become clearer when you start working with creating components for sites (like lists and columns) and combining them to form a real site-template. When you go to the Site designs option again, you will see all the designs which have been added to the site. You then will have to ask your site-owners to apply the new site design or use PowerShell to apply them.